Last time we battled with Mardu Pyromancer, one of the decks I would consider placing among the top three in the format. This time we’re going to mix it up with something a little spicier. The deck caught my eye after quietly sneaking in to the Top 8 of the SCG Baltimore Team Open. Star City called it “Goryo’s As Foretold,” but that name doesn’t encapsulate everything that’s going on. 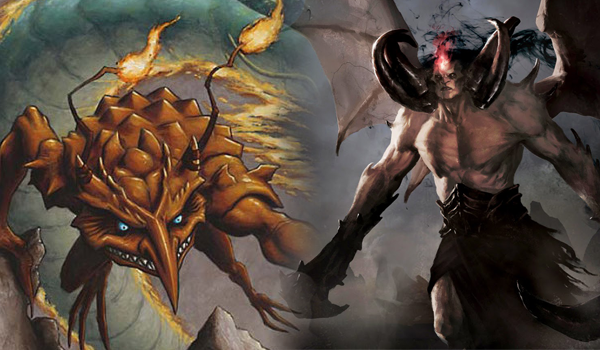 What we’re really looking at is an amalgam of several powerful combos in Modern all alongside each other, including both a Kiki-Jiki and a Griselbrand kill. I must admit, when first looking at the deck it seemed all over the place. Even after the initial shock wore off, it was clear the deck had a ton of moving parts. Once I played a few games however, it felt like a puzzle where all the pieces came together in just the right way. The deck does attack from a lot of different angles, but its ability to do so is one of its greatest appeals. Think of the most comparable deck, Grishoalbrand. (One could argue Mono-Blue Living End is a closer parallel, but we’ll forgo that discussion for now.) Grishoalbrand is an A+B combo deck that is trying to put a Griselbrand into play via either Goryo’s Vengeance or Through the Breach. As such, it is a relatively easy deck to Thoughtseize. Yes, it has two plans, but most hands will still have clear targets for disruption. Now consider our As Foretold monstrosity. It is essentially a combo deck with the ability to assemble A+B, or B+C, or C+D, and so on. Many of our “combos” don’t win the game on the spot; in fact, only Deceiver Exarch plus Kiki-Jiki, Mirror Breaker kill immediately. However, As Foretold plus Ancestral Vision puts the deck very far ahead, as does Goryo’s on Griselbrand. In the latter case, usually you can set up to win the game the following turn, often with redundancy. Consider the possibility that you were able to assemble As Foretold and Living End, but weren’t able to find a Deciever. Guess you’ll have to settle for a one-sided Wrath of God that also reanimates that Griselbrand you pitched! Having all these different options frequently makes your hand quite the puzzle for your opponent and generally makes it easier for you to rebuild post-disruption. Certainly some consistency problems with the deck will be quickly discovered, but the sheer amount of card draw can help quite a bit. Between Ancestral Vision and Faithless Looting alone, you will be seeing your fair share of cards. A quick aside, but an important one: you’ll notice that I’ve been playing a ton of Looting decks in Modern lately—Dredge, Mardu, Goryo’s (and even a Soulflayer deck). Faithless Looting is absolutely busted. It’s easily in contention for Modern’s best cantrip, rivaled only by Ancient Stirrings. Basically every time you register a 75 with Looting in it, you want to draw it nearly every turn. I can’t count the number of times I’ve said or thought, “If I can just draw Looting here…” I don’t think the card is too good for the format, but I do think it bears mention that we should be playing it whenever reasonably possible. It struggles a bit against graveyard hate, but honestly, what powerful card doesn’t these days? Really though, can we just not talk about graveyard hate? This deck does not do well against basically any piece, and certainly not with hard hate like Leyline of the Void or Rest in Peace. Sure, it has some ways to fight back, and nothing is stopping you from assembling Exarch plus Kiki the “hard” way. Realistically though, the deck is not well set up to make that happen. Any deck that presents yard hate and a reasonable clock will generally take you down. In this way, I think Grishoalbrand looks favorable in our mini-comparison—that deck performs much better against that kind of disruption. Breach is the perfect way to get around your opponent’s Rest in Peace. That said, I’m honestly not sure which deck is better, and I think there is a genuine debate to be had. My results with this deck have been surprisingly positive and it has undoubtedly been a blast. I think more tuning could definitely be done to the list, and I’m looking forward to see if the archetype produces any results in the future.